Force jumped atop the class with a pass of 3.910-seconds at 326.16 mph during her second qualifying run of the day. She currently leads all NHRA competitors with nine No. 1 qualifiers on the year as she also has a category-best four wins at this point in the season. Jack Beckman jumped into second in the class with a 3.929 run at 324.51. Millican drove to the preliminary top spot with a run of 3.700 at 327.98. 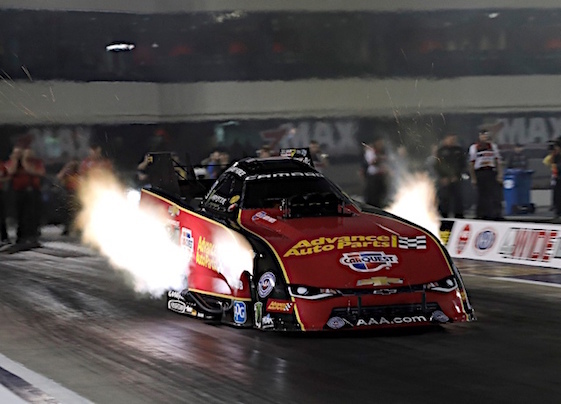 Millican is chasing his seventh No. 1 qualifier of the year as he also looks for his first career top spot at Sonoma Raceway. Leah Pritchett is second in current Top Fuel qualifying after her 3.727 at 328.38. His teammate Jason Line is currently qualified second following a 6.517 at 211.03. SONOMA, Calif. — Friday’s results after the first two of four rounds of qualifying for the 31st annual Toyota NHRA Sonoma Nationals at Sonoma Raceway, 15th of 24 events in the NHRA Mello Yello Drag Racing Series. Qualifying will continue Saturday for Sunday’s final eliminations. Top Fuel — 1. Clay Millican, 3.700 seconds, 327.98 mph; 2. Leah Pritchett, 3.727, 328.38; 3. Antron Brown, 3.744, 327.43; 4. Tony Schumacher, 3.747, 327.98; 5. Brittany Force, 3.752, 328.78; 6. Blake Alexander, 3.775, 326.16; 7. Scott Palmer, 3.778, 323.35; 8. Doug Kalitta, 3.790, 324.05; 9. Terry McMillen, 3.821, 318.39; 10. Mike Salinas, 3.823, 322.34; 11. Richie Crampton, 3.828, 321.73; 12. Shawn Reed, 3.968, 298.14; 13. Steve Torrence, 4.187, 202.91; 14. Jim Maroney, 5.025, 139.95. Funny Car — 1. Courtney Force, Chevy Camaro, 3.910, 326.16; 2. Jack Beckman, Dodge Charger, 3.929, 324.51; 3. Bob Tasca III, Ford Mustang, 3.950, 318.47; 4. Matt Hagan, Charger, 3.956, 319.98; 5. Tim Wilkerson, Mustang, 3.975, 309.56; 6. Ron Capps, Charger, 3.976, 321.42; 7. Tommy Johnson Jr., Charger, 3.988, 322.04; 8. Cruz Pedregon, Toyota Camry, 4.032, 296.70; 9. Robert Hight, Camaro, 4.051, 318.24; 10. Richard Townsend, Camry, 4.055, 307.72; 11. Jim Campbell, Charger, 4.082, 306.95; 12. John Force, Camaro, 4.086, 314.17; 13. J.R. Todd, Camry, 4.102, 312.13; 14. Del Worsham, Camry, 4.164, 254.18; 15. Shawn Langdon, Camry, 4.287, 232.51; 16. Jonnie Lindberg, Mustang, 4.725, 169.44. Not Qualified: 17. Jeff Diehl, 6.383, 104.14; 18. Terry Haddock, 8.971, 79.09. Pro Stock — 1. Greg Anderson, Chevy Camaro, 6.515, 211.16; 2. Jason Line, Camaro, 6.517, 211.03; 3. Tanner Gray, Camaro, 6.531, 210.90; 4. Bo Butner, Camaro, 6.538, 211.89; 5. Erica Enders, Camaro, 6.540, 211.10; 6. Jeg Coughlin, Camaro, 6.544, 210.80; 7. Drew Skillman, Camaro, 6.547, 211.33; 8. Chris McGaha, Camaro, 6.550, 210.60; 9. Vincent Nobile, Camaro, 6.553, 209.98; 10. Deric Kramer, Camaro, 6.560, 210.50; 11. Fernando Cuadra, Camaro, 6.580, 209.43; 12. Alex Laughlin, Camaro, 6.603, 208.52; 13. Matt Hartford, Camaro, 6.748, 182.55; 14. Joey Grose, Camaro, 6.780, 205.79; 15. Alan Prusiensky, Dodge Dart, 7.163, 151.83; 16. Steve Graham, Camaro, 8.732, 108.53. Pro Stock Motorcycle — 1. Eddie Krawiec, Harley-Davidson, 6.780, 198.76; 2. Hector Arana Jr, Buell, 6.803, 200.11; 3. Andrew Hines, Harley-Davidson, 6.837, 197.65; 4. Joey Gladstone, Suzuki, 6.837, 195.59; 5. LE Tonglet, Suzuki, 6.843, 197.31; 6. Steve Johnson, Suzuki, 6.863, 195.62; 7. Matt Smith, Victory, 6.877, 195.93; 8. Jim Underdahl, Suzuki, 6.888, 195.56; 9. Angie Smith, Buell, 6.902, 192.91; 10. Ryan Oehler, Buell, 6.903, 194.63; 11. Angelle Sampey, Buell, 6.914, 194.44; 12. Jerry Savoie, Suzuki, 6.914, 193.74; 13. Karen Stoffer, Suzuki, 6.925, 195.48; 14. Cory Reed, Buell, 6.975, 195.70; 15. Scotty Pollacheck, Suzuki, 6.981, 191.00; 16. Kelly Clontz, Suzuki, 6.992, 192.17. Not Qualified: 17. Freddie Camarena, 7.021, 192.63; 18. Katie Sullivan, 7.044, 190.48; 19. Hector Arana, 7.048, 197.91; 20. Scott Bottorff, 10.187, 99.28.